Irish Abstract Artist (Cubist). Biography, Paintings. The abstract artist and figure painter Mainie Jellett was born in Dublin. She studied drawing and fine art painting at the National College of Art in Dublin and under Walter Sickert at the Westminster Art School in London. It was in London that she met her lifelong friend and fellow artist Evie Hone. Jellett had precocious talent as a painter, and while starting out as a follower of Impressionism she began - as a result of her association with the Parisian abstract painter and teacher Albert Gleizes - to develop a greater interest in modern abstract art like Cubism. Along with Evie Hone and Mary Swanzy, Jellett was one of the earliest abstract painters in the history of Irish art. In 1923, together with a like-minded Evie Hone, she staged one of the first abstract painting exhibitions seen in Ireland at the Society of Dublin Painters. While the critics were horrified at the evident lack of "representational art", later art experts acknowledge Jellett's role in helping to maintain contact between European and Irish art. Mainie Jellet continued to paint in the abstract Cubist style and to exhibit. WB Yeats opened one of her exhibitions in 1926 at the Dublin Radical Club, while she again exhibited at the Dublin Painters Gallery in 1926, 1927, 1928 and 1929. In addition, she exhibited abroad several times during the 1920s: in Paris, Versailles, Brussels, London (with the London Group), and Amsterdam. From 1930-1937, she showed at the Royal Hibernian Academy (RHA). From 1931, she also exhibited with the Water Colour Society of Ireland (WCSI), showering over 45 paintings from 1931-1943. More exhibitions followed, at the Gate Theatre and St Stephens Green. Throughout the 1930s she wrote about and taught art - the latter in both Dublin and Cork - playing an important role in the history of Irish painting, as an early proponent of abstraction in art and as a champion of the modern movement. Although Jellett's pictures were often attacked critically, she proved eloquent in defense of her ideas. Her resilience may have been due to her firm Christian beliefs. Indeed, a number of her paintings, though quite abstract, have religious titles and are similar to icons in tone and palate. Along with Evie Hone, Louis le Brocquy, Jack Hanlon and Norah McGuinness Jellett helped found the Irish Exhibition of Living Art in 1943. She died a year later, aged 47. 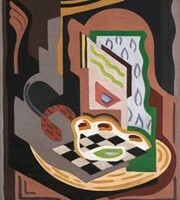 Mainie Jellett's work is represented in many collections including: Crawford Art Gallery, Cork; Niland Art Collection, Sligo; Butler Gallery Collection, Kilkenny; Trinity College, Dublin; The Hugh Lane Municipal Gallery, Dublin; The Irish Museum of Modern Art, Dublin; The National Gallery of Ireland, Dublin. The auction record for a work by Mainie Jellett was set in 2006, when her oil painting, entitled Abstract Composition, was sold at Sotheby's, in London, for £84,000.  For more about modernist artists in Ireland like Mainie Jellett, see: Irish Art Guide.  For more about abstract art, see: Homepage.